They are marked by lines and spots. They inhabit warm coastal waters of the Atlantic, Mediterranean and the Indo-Pacific. Feeds on sea urchins, coral, crabs and other crustaceans, mollusks and tube worms. Their size varies from 30 cm (1 foot) to 75 cm (2.5 feet). Most are solitary diurnal fishes. They feed on hard-shelled invertebrates. A few feed on large zooplankton or algae; drifting above the reef. They lay their demersal eggs in a small hole, just dug in the ground. Some species guard their eggs. They have a roundish, laterally flat body with an anterior dorsal fin. They can erect the first two dorsal spines . The first one locks and the second one unlocks. This prevents predators from swallowing them or pulling them out of their holes. This locking and unlocking behaviour is why they are named 'Triggerfish'. They have a small pectoral fin, fused to one spine. Their small eyes, situated on top of their big head, can be rotated independently. They have tough skin, covered with rough rhomboid-shaped scales that form a tough armour on their body. Their big, angular-shaped head extend into a snout with strong jaws and sharp teeth, made for crushing shells. Each jaw contains a row of eight teeth, while the upper jaw contains another set of six plate-like teeth. Triggerfish can be quite aggressive. In particular, the Titan Triggerfish is known to viciously defend its territory against any intruders including scuba divers and snorkelers. 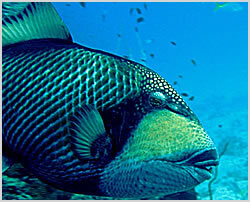 Take special care when you see triggerfish encircling their nest area. It will raise its dorsal spine when it feels threatened. The nest's territory is a vertical V-shape. If you happen to find yourself in the wrong place, the quickest way to get out is to swim away horizontally, not vertically. Try to put your fins between you and the fish if it charges. Distribution: Indo-Pacific: Red Sea south to Delagoa Bay, Mozambique and east to the Line and Tuamotu islands, north to southern Japan, south to New Caledonia; throughout Micronesia.